We are a part of the national Bail Out The People movement which formed in 2008 to fight against the bailouts to the banks. Since then we have been in numerous fights against poverty, racism and war. We demand that the people be bailed out not the banks, a moratorium on all foreclosures, a federal jobs program now and other demands. We have been participating in the Wisconsin people's uprising, Bloombergville in NYC and numerous other people's actions. Green Bay, April 24, 2019: JFC #WIBudget Hearing, Budget For The People Not the Banks! UW Green Bay, 2420 Nicolet Drive, Green Bay, 10 A.M. – 5 P.M.
Donald Trump: Racist Tool of the Rich, Enemy of the Poor! Protest in Green Bay April 27, 2019! Money for People’s Needs not Racist Hate! Randi Weingarten, President of the AFT, in Somerville, MA helping to support UFCW members on strike. 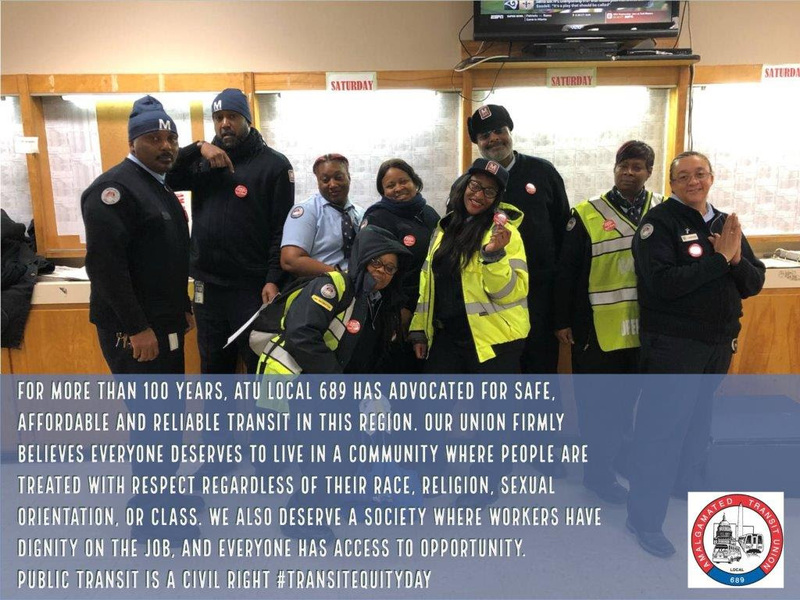 The Amalgamated Transit Union and its D.C. Local 689 ATU Local 689 is blasting a reported plan hatched by right-wingers to privatize Washington’s Metro system, including the buses and the subway. The Metro board has already turned over one garage, in suburban Virginia to privatizers. Privatizing would cut service to Metro’s hundreds of thousands of daily riders, the union said. The subway, despite recent declines, is among the three busiest in the U.S., and Metrobus carries hundreds of thousands more. “If you sit in the windowless boardroom of” Metro headquarters, “you’d think ‘privatization’ is a silver bullet that will magically eliminate costs and restore ridership to its heyday,” said Local 689 president Raymond Jackson. “Nothing could be further from the truth.” The solutions are expanded and improved service, as has occurred in Seattle and Houston, he said. That means more investment in repairs and upgrades – and in union workers and their wages. “Transit experts know how to fix this,” he said. So does Jackson’s local, which made the same recommendations last year, and so does Metro staff, unlike its management, he added.